“Diagnosis.” Ten years ago, when my healthy baby boy entered this world just after midnight on a hot summer night, I never imagined that word would someday enter his vocabulary — or mine — so frequently. But here we are, three and a half years since we learned Miles had type 1 diabetes, and his diagnosis story is the thing I am most often asked about by friends, relatives, and other nervous parents. But what no one ever asks about is something that was ten times more difficult than the day I learned my 6-year-old had an incurable chronic illness. For me, the hardest part wasn’t bringing Miles to the hospital. It was bringing him home. It was the days and months that followed, when I faced the overwhelming 24/7 responsibility of managing an illness that I knew nothing about mere moments before. 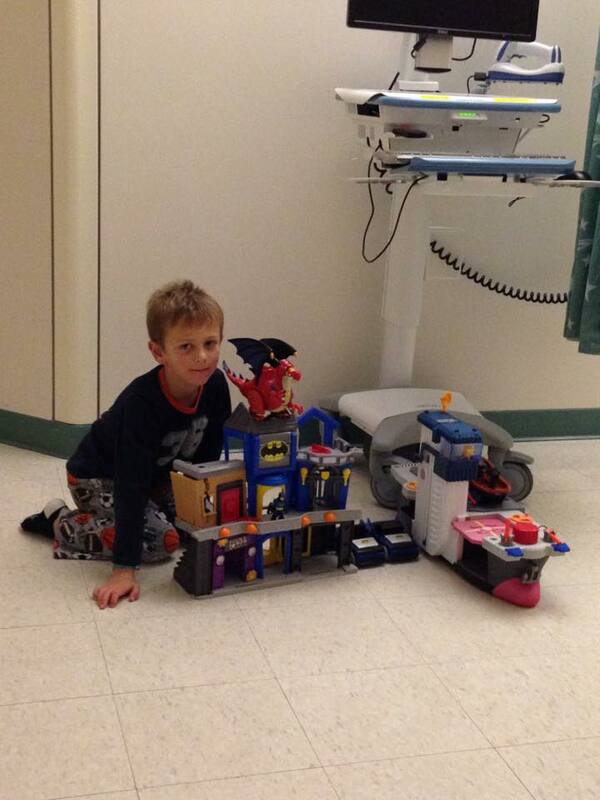 Miles was diagnosed with T1D on October 22, 2013, at a children’s hospital near our home in Maine. It was shocking, but I tried to take the news in stride. With my husband, I learned all I could from the diabetes educators and endocrinologist at the hospital. I stayed positive, always the optimist, and knew he’d be okay. In fact, I couldn’t wait to get him home — so I convinced the hospital staff that we understood the illness and his needs well enough to be released a day early. But leaving the hospital, where we’d had three days of round-the-clock care from trained medical professionals, was scarier than I predicted. Much like the day we brought him home from the hospital as a newborn, suddenly we were on our own. No doctors answering questions, no nurses administering shots, no one else there with more experience and expertise than us. The giant responsibility of being the sole force keeping this little human being alive — it wasn’t something I expected to have to come to terms with twice. Walking through the kitchen door on a Friday evening, my mother and two other young children were there waiting for us. It was so good to be home, back together! Before I could even put our bags down or begin to explain to my mom what we had just been through, Miles immediately started to rummage through the lower cabinet for something to eat. I panicked and screamed at him to stop. “You can’t just eat whatever you want,” I shouted, too loudly. “We have to count the carbs and give you a shot!” He stopped, and began to cry. Feeling guilty but worried about how we would manage this disease at home, all I could think about was the design of my kitchen, with food stored in lower cabinets within easy reach of Miles. That would have to change. He was only 6, and I needed to know when he was eating and what he was eating. This hadn’t entered my mind in the hospital, where we carefully ordered his meals off a menu with carb counts clearly labeled. In the days that followed, I began to see all of the other things that would need to change in his life. That weekend, he was invited to a birthday party. Normally I would have dropped him off and picked him up two hours later, excited to hear about the games, the music, and, of course, the treats he enjoyed with his friends. Instead, our whole family stayed with him, nervously watching the hostess set out a dozen little bowls of candy for the kids to decorate their own cupcakes. We needed to check Miles’ blood sugar and give him his shot, and he made us do it in a separate room, away from where all the party fun was happening. Guessing how many carbs he would eat at this candy free-for-all was a real challenge. Then there was the sleeplessness. Again, I thought we left nighttime feedings and taking turns checking to see if he was still alive behind us when our kids outgrew the newborn phase. Not so much once we welcomed type 1 diabetes as the fourth child into our family. Our endocrinologist and diabetes educators told us to give it two weeks, then we could start sleeping through the night again. Ha! There is no way to sleep soundly when you’re newly responsible for someone’s blood sugar. What if he’s high? What if he’s low? How will I know either way? Nighttime brought constant anxiety and fear. Unlike the early days with my baby boy in my arms, feeding and caring for him every minute of the day, type 1 diabetes is not something he will outgrow. But over time, it has gotten easier. Today, Miles uses both a CGM (continuous glucose monitor) and an insulin pump. This technology has taken so much stress out of the equation. And at 10 years old, Miles now understands so much more about his diabetes, and he’s mature enough to manage more of it on his own. I no longer feel the need to hover over him every minute like I did in the beginning. He keeps an eye on his CGM and boluses himself using his pump, working with me or another caregiver to estimate his insulin needs. And if he doesn’t get it right, we fix it. Together. This is something I never could have imagined during those first overwhelming months at home when all of his care fell squarely on his dad and me. No matter how old he is, I’ll never stop worrying or wondering what his blood sugar is, whether he dosed correctly, and whether he has a juice box with him wherever his life takes him. But even though I still worry, it’s never as hard as those first months after diagnosis — that period of time nobody seems to want to ask you about later. If they asked me now, I’d tell them: You find your “new normal,” and you adjust… just like you adjusted to parenting after the first few scary weeks at home with a newborn. You can do this. It’s never easy, but it gets easier. I promise.